During the 1950s and 60s, Soviet society saw a huge increase in urbanization. Nearly half of society was considered urban and universally literate. This expansion of higher education and training created a more complex world. Improvements in transportation, communication, and education helped draw people into these more urban areas and urban-based culture as a whole. In addition to these changes in urbanization, work weeks and work days were shortened during this period. Work-days were shortened from eight to seven-hour days, while the work-week was shortened from six to five days. This change in how long people were spending at work per week led them to enjoy more leisure time. With all of these developments, people were able to devote time to spectator sports. In 1956, Moscow’s Luzhniki Sports Complex, “located at the southern bend of the Moscow river,” opened its doors (Seventeen Moments). The complex was seen as a symbolic representation of the massive transformations that all of the Soviet Union was undergoing at the time. Inside the Luzhniki Complex were soccer fields, tracks, swimming pools, and basketball, volleyball, and tennis courts. One of the massive stadiums, named Lenin Stadium, held 103,000 people and was actually one of the largest in the world at the time. 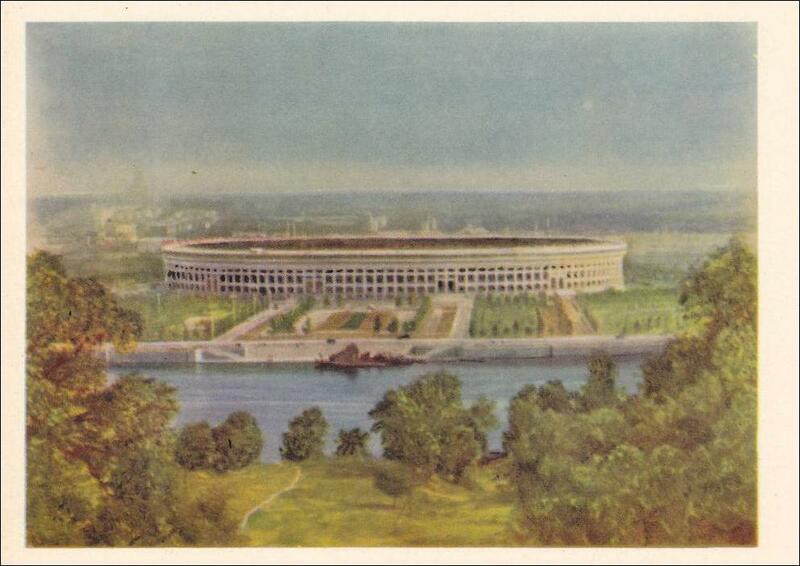 The Luzhniki Complex, included the first of many new stadiums to pop up over the Soviet Union. By 1960, the number of stadiums had increased by about 1,400 and by 1968 there were over 3,000 structures of the sort. The dramatic increase in the number of stadiums reflected the increase in leisure time that many citizens enjoyed during the fifties and sixties. In addition to those already enjoying soccer and hockey, people who were otherwise not interested, started to pay more attention to these events because of the expanding industry. I can totally understand how this complex was seen as a symbolic representation of the Soviet Union’s transformation of this time. Even to me at first glance it looks like the Soviet Union is doing pretty well with a massive (and expensive) complex where citizens could go see a game on their newly freed-from-work weekends. I enjoyed your post examining the evolution of leisure time during the 1950s and 60s. The establishment of stadiums of such size and grandeur help signify the Soviet Unions’s increasing economic standing as well as giving something back to the people for them to enjoy. What a good reminder of the importance of leisure and public sporting events to postwar Soviet society. Luzhniki is still a major landmark in Moscow! Did you find any discussion of the stadium or other leisure activities in the Current Digest? I liked that you tied the growth of urbanization to the growth of sports viewership and other leisure activities. During your research, did you find anything about the demographics of people who migrated to urban centers? Were they young or old? Russian or another ethnicity?